Rounding off their 2010 Spring Seminar programme, Dennis Mowers recently held a Fine Turf Maintenance Seminar at Uxbridge Cricket Club. The event was organised in conjunction with Richard Taylor Machinery of Aylesbury who was delighted with the attendance figures. Over 50 Groundsmen heard presentations from Richard Brown of British Seed Houses, Geoff Yelland from AmegA Sciences and grounds maintenance expert Dave Bracey. Midlands based mower manufacturer Dennis have won a prestigious order to supply a total of 27 machines to the stadia and training facilities at the 2010 FIFA World Cup. These will be supplied through Dennis' partner Smith Turf, one of South Africa's largest dealers based in Johannesburg with a network of support centres around the country. With strict regulations in place to protect worker's exposure to hand-arm vibration (HAV), professional grounds maintenance equipment manufacturer Dennis, are continually striving to improve their machines in recognition of the need to counteract harmful vibration. Vibration can damage blood vessels and nerves in the fingers, leading to a loss of feeling in the fingers and hands. It can cause the industrial disease â€˜vibration white finger' which, in extreme cases can make it too painful for workers to hold equipment. 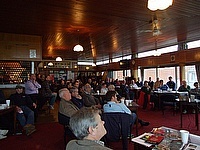 Whilst the outdoor conditions weren't great more than 150 groundsmen heard presentations from Richard Brown of British Seed Houses, Roy Daniels from the IOG, Dr Christian Spring, Jay Dobson and Fiona Crossly from the STRI, Ian Henderson from Golf Finance and grounds maintenance expert, Dave Bracey. Bowls Clubs, Local Authorities, Contractors and private users were amongst the attendees keeping the speakers busy with questions from the floor. 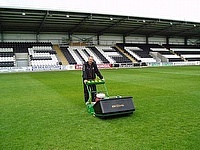 St Mirren Football Club relocated from their old stadium on Love Street to a modern, state of the art stadium on Greenhill Road in January of this year. â€œThis signified not just a change in location, but also a total change in pitch construction,â€ says Thomas Docherty, head groundsman at the Club. â€œThe old pitch was a traditional soil construction with no proper irrigation, whilst the pitch at the new ground is made of Fibresand together with an up-to-date irrigation systemâ€. George Mansfield who lives in East Sussex is typical of the Dennis customer who expects the best from his machinery and finds all of his requirements fulfilled by the Derbyshire company. George runs a water effluent treatment company, Wendage Pollution Control, which includes a maintenance division that keeps pumping stations and sewage treatment plants tidy with hedging and strimming services, so he is well acquainted with professional quality groundscare machinery. 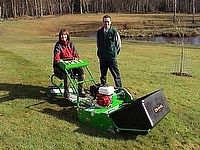 Speakers from Dennis are Alan Ronaldson (Scottish venues) and Toby Clarke (Yorkshire), providing an insight into the company's market leading range of machinery for bowling green maintenance with â€˜on green' demonstrations. Seminar delegates will get the chance to inspect the new Razor Ultra 560 mower and S500 Plus spiker/slotter at close quarters and learn how these exciting new machines can improve playing conditions on greens. 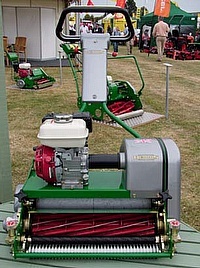 Taking a prominent position on the Dennis stand M9 at BTME is the new Razor Ultra 560 mower. 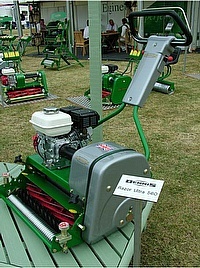 The newest addition to Dennis's range of professional grounds maintenance equipment, the Razor's development was fine tuned using feedback from greenkeepers and groundsmen after it was previewed at the 2009 event. 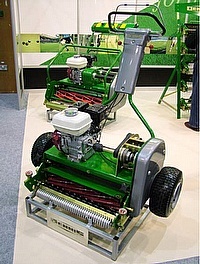 Greenkeepers and Golf Course Managers should it a make it a priority to visit Dennis on stand M9 at BTME this year to inspect the new Razor Ultra 560 mower. Developed with input from industry professionals following its exclusive preview at BTME 2009 and designed for a high quality cut on greens and tees, the new 22â€ mower features an eleven blade cylinder and groomer along with a host of other advanced features. Dennis Mowers has seen sales almost triple since 1998, and they've been bursting at the seams because of it - but not for much longer. 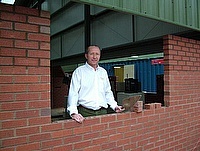 Building work started in mid August 2009 for a new building of 9,600 sq ft next to their existing factory. This will effectively double their existing manufacturing and assembly capacity. John and Raymond Dennis were brought up in Huntsham in Devon. John then moved to Guildford where, whilst working for an ironmonger Filmer & Masons, he started making bicycles in his spare time. These sold at a profit and in 1895 he set up his own business, the Universal Athletic Stores in Guildford High Street, selling bicycles and other sports goods. Dennis launches an exciting new mower at Saltex on stand W58, developed with the help of its customers, who were invited to give their feedback when the design was previewed at BTME this year. The Razor Ultra 560 is an exceptionally versatile cylinder mower for applications ranging from golf greens and tees to cricket pitches and bowling greens. 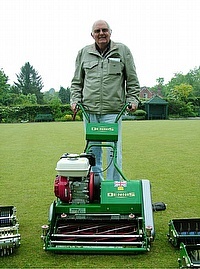 Dennis mowers are famous for their Bowls seminars, but the one held recently at the Ye Olde Knowle Bowling Club contained a surprise for British Seed Houses. 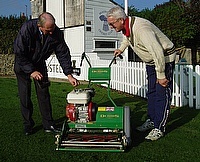 Harvey Brereton, greenkeeper at ENTACO Bowls Club, Studley, Warwickshire, was a delegate at that Seminar and extolled the virtues of the close mowing he got from his 12 year old Dennis FT510 - so much so he's put a new one on his wish list! Dennis Mowers will present three exciting new products at Saltex on stand W58, offering groundsmen cutting edge technology for fine turf maintenance. Dennis is dedicated to working closely with its customers, and the latest mower to join the line up was exclusively previewed at BTME this year to allow the experts - those who will actually use the equipment - to have a say in its final specification. 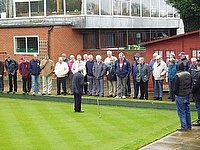 Whomsoever they may be, they all share the same passion as those who attended a recent seminar aimed at helping green keepers to improve their bowling green; whatever the ground conditions. 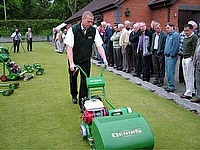 Hosted by Dennis Mowers, and supported by Parks and Grounds Machinery Ltd., the event took place at Ye Olde Knowle Bowls Club in Dorridge, Solihull. 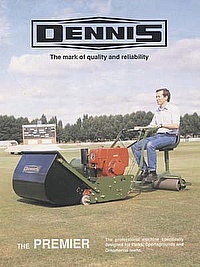 The proven reliability and excellent finish achieved by his existing Dennis mower made the company's machines the obvious choice when Nick James, head Groundsman at the Heatons Sports Club, was able to invest in a new mower for his cricket square. Nick is kept busy looking after the turf at the Cheshire club, where he has been based for six years, preparing surfaces for tennis, lacrosse, cricket and rugby. Following their Cricket seminar at Uxbridge Cricket Club earlier this year, Dennis and SISIS are once again offering cricket groundsmen the opportunity to attend this successful seminar. The venue this time is Essex County Cricket Club in Chelmsford and the date is Tuesday 22nd November 2011, commencing at 9.00am. Dennis completes the "Follow On"
After a very successful Fine Turf Seminar at Uxbridge County Cricket Club last year, Dennis recently returned for a repeat performance. Hosted once again by Vic Demain, in conjunction with Dennis and Cricketworld.com the focus this time was to support local cricket Groundsmen in the Middlesex and surrounding counties.